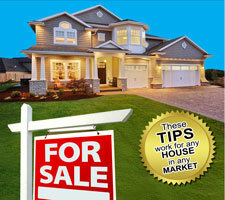 Get your FREE copy today of “How To Sell Your Home For More Money...And Sell It Faster! How one seller sold his home for $110,000 more than the exact same home down the street. (If you play your cards right, then you could do the same thing with your home.) Page 29. The Secret Strategy the “Rich & Famous” use to sell their homes for more money. (This works for rich or poor alike.) Why should the rich get richer? It’s time for you to get a bigger piece of the pie! Page 29. How to immediately gain the upper hand in any negotiating situation, even if you don’t know a thing about negotiating. Page 66. A nifty little trick where you can spend $5,000 and increase your home’s value by $30,000. Page 41. The best strategy for pricing your home so that it sells quickly and for the highest price possible. (This is the same strategy Realtors use for their personal homes.) Page 72. The one simple trick that causes “tough as nails” negotiators to forget about negotiating and gladly pay full price for your home. (I didn’t think this could happen until I witnessed it myself.) Page 20. The single most costly mistake home sellers make. This mistake almost guarantees you will lose tens of thousands of dollars on your sale. Page 59. Did you know that buyers decide whether or not they will buy your home within the first ____ seconds of seeing it? Get the details on Page 35. How to use the negative features in your home to work in your favor and actually make the buyer want to buy it even more. Page 26. How to get buyers to “fall in love” with your home as soon as they see it and agree to pay you top dollar. Page 20. How to steal buyers from your competition and convince them to buy your home instead. Page 26. Enter Your Information Below to Receive Your Free Copy!